When I was pregnant with my first son (in 2009), I had the incredible opportunity to be a paid blogger for What to Expect When You’re Expecting’s website. This first introduction into the world of working online opened my eyes to the potential of working from home, & I haven’t looked back since! 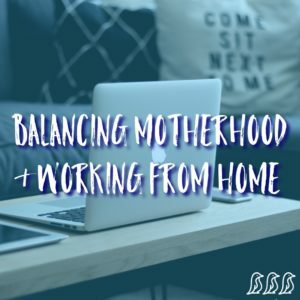 I always wanted to stay home with my children, & working online from home allowed me to pursue a career, hone my skills, & give me flexibility to set my own schedule. But… even though it is the ideal situation for me & my family, it is not easy! You can try, but you are going to become frustrated, overwhelmed, & down on yourself. Trying to do it all feels like you aren’t doing anything well. Instead, I have found it helpful to make sure that I am clear on my priorities. My two main priorities right now? My family & my career. This makes it very clear that other areas & responsibilities are simply not a priority right now. Unfortunately, just because cleaning my house or making dinner isn’t a priority right now doesn’t mean that it magically happens without me. But it does mean that I can look for creative solutions & ask for help in those areas. I recently started ordering groceries online, & then I simply have to pull into the designated parking spot, call them, & they bring everything out to my car. I am also signed up for Home Chef so that we get nice, better-than-takeout meals delivered to our doorstep (you can skip weeks whenever you’d like, so I typically do this bi-weekly to save a little bit of money). When it comes to cleaning the house, I’ve been enlisting the help of the whole family more often instead of letting the burden fall on me alone. But I also have friends that use & love cleaning services! The other piece of letting go of trying to do it all is letting go of the guilt. You should not try to do it all, & you should not feel guilty about that. Working from home is wonderful. There are flexible hours so that you can be there for your kids when they need you, & you can work at the kitchen table while they play beside you. But… the downside is that it is very hard to set aside time where you can truly focus. Even when you try to set aside time to work, it will quickly get over-ridden by someone with a “real” job. There have been times where I was going to leave the house (or lock myself in a room) for a few hours in the evening, but then my husband ended up working late… If I had to go to a job & clock in a certain time, that wouldn’t have happened. It is hard to make working from home a priority, & it is okay to maintain flexibility, but the problems arise when this type of thing happens over & over again. Seeking out childcare for my young kids was one of the best decisions I made. I am able to knock out a whole bunch of work in minimal hours that they are in childcare, & then I can spend more quality time with them when they get home instead of feeling like I had to work in 5 minute spurts whenever the opportunity arose. There are times when I feel like I work every day, weekend, & evening but am not accomplishing as much as I’d like to – this is often a symptom of inefficiency & is a sign that I need to revamp my schedule. There are SO many benefits to working from home, but I oftentimes find myself forgetting that this is a luxury. I could have the flexibility to go out to breakfast once in a while or go do something fun during the day. I can work outside, at a coffee shop, or at the library. I can work ahead & then take a little bit of a breather. But I tend to get stuck in the daily grind. I get caught up in the workload & the day to day tasks, & I forget that I have a ton of control – ball’s in my court! Working from home is hard. Working from home is work. Working from home is stressful. But working from home is the best of both worlds for me!